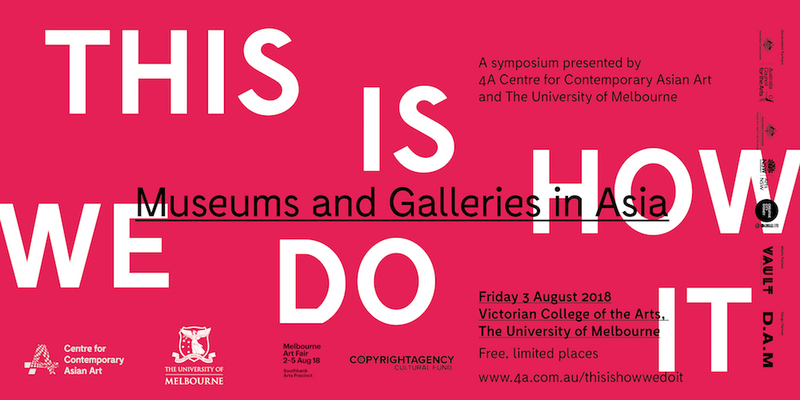 4A Centre for Contemporary Asian Art and the University of Melbourne invite you to join us for 4A’s 2018 symposium, This Is How We Do It: Museums and Galleries in Asia. This Is How We Do It: Museums and Galleries in Asia brings together leading professionals from museums and galleries across wider Asia to share experiences and discuss what’s next for our region’s cultural and creative spaces. With international experts including Philip Tinari (China), director of Ullens Center for Contemporary Art, Beijing; Joselina Cruz (Philippines), director of the Museum of Contemporary Art & Design (MCAD), Manila; and Reem Fadda, independent curator (Palestine); alongside local speakers representing community, state and national institutions and organisations, this symposium seeks to generate debate and discussion around the central question of how Australia’s arts ecology can learn from and embrace new models and practices from our Asian neighbours.